With October only days away, this is the time of year when we start looking for an uptick in bird flu reports - partially because of cooler autumn temperatures - and partially because in the fall migratory birds head south from their high latitude summer roosting grounds. Today we've two media reports of avian flu activity; one from Vietnam and one from South Korea. 26-9, Livestock and Veterinary Station (T-TY) Dak Ha district (Kon Tum) officially tested specimens from the Animal Health Agency Region 5. The result, the samples were taken nearly 4,700 poultry on the family Tran Duc Hoa positive for influenza virus A / H5N6. Earlier, on 22-9, nearly 4,700 poultry son of Mr. Tran Duc Hoa family (living in Thanh Xuan village, Dak Ngoc commune, Dak Ha District, Kon Tum) was sick and dead simultaneously. Immediately after receiving the report, Station T-TY Dak Ha district took samples sent for testing at the Regional Veterinary Authority 5 (Dak Lak). In 26-9, immediately after receiving the test results, Station T-TY Dak Ha district administration in collaboration with Dak and his family Ngoc Hoa organized destruction of entire 4,700 birds (ducks, geese, chickens) and 3,000 eggs. At the same time, T-TY Station district veterinary officer appointed to coordinate local authorities continue to monitor the outbreak; guide farmers to conduct disinfection, management of landfills and poultry. This is the 2nd time in 2 consecutive years, influenza A / H5N6 appeared in poultry Hoa of his family. Earlier, in May 1-2016, influenza A / H5N6 has also appeared on the 2,100 poultry, prompting his family Hoa to destroy, damage more than 140 million. H5N6 first appeared in Vietnam in the summer of 2014, and we've seen sporadic outbreaks there - and in Laos - since then. H5N1 still plagues the region (see Vietnam: Thousands Of Vaccinated Chickens Die Of Suspected H5N1) and Vietnam hopes to deploy a locally produced - and hopefully more effective - vaccine next year. 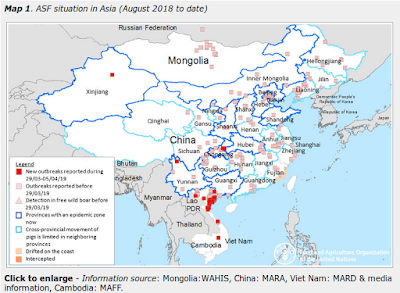 Vietnam's biggest avian flu concern remains the incursion of H7N9 out of China, which was reported within 100 km of their northern border last spring (see H7N9 Inches Closer To Vietnam's Northern Border). Meanwhile, from South Korea we get this report on the environmental detection of H7N9 (pathogenicity to be determined) in North Gyeongsang Province. SEOUL, Sept. 26 (Yonhap) -- A South Korean provincial government said Tuesday that the avian influenza (AI) virus had been found in bird excretions in the southern part of the country. The government of North Gyeongsang Province said the H7N7 strain of avian influenza was detected in the excretions of wild birds in Yeongcheon, 344 kilometers south of Seoul. The Ministry of Agriculture, Food and Rural Affairs will check to see if the virus is highly pathogenic by Friday though most of the H7N7-type viruses found in North Gyeongsang Province have turned out to be weakly pathogenic, the provincial government said. The Gyeongbuk government and Yeongcheon city have designated everything within a 10 kilometer radius of the virus detection point under quarantine, banning poultry farms from relocating hens, ducks and geese until the examination is completed. In the Gyeongbuk area, a highly pathogenic strain of avian flu broke out in November last year. You may recall that South Korea Reported both LPAI H7N7 & H7N2 In Wild Birds in December of 2016, an event which was overshadowed by the arrival and rapid spread of HPAI H5N6 though South Korea's poultry industry. LPAI viruses are quite common in wild birds, cause little illness, and only rarely death. They are not considered to be a serious health to public health. The concern is (particularly with H5 & H7 strains) that LPAI viruses have the potential to mutate into HPAI strains. HPAI viruses are more dangerous, can produce high morbidity and mortality in wild birds and poultry, and can sometimes infect humans with serious result. The type of bird flu scientists have been watching closely for the past decade has been HPAI H5 (and to a lesser extent HPAI H7s & H9s). Before the middle of the last decade, there was no uniform requirement to report or track LPAI infections. That changed in 2006 when the OIE made reporting of all H5 & H7 viruses mandatory. The finding of LPAI H7 viruses in Korean wild birds is therefore not terribly surprising, and under normal circumstance would scarcely warrant a mention. But with the feared return of highly promiscuous and mutable clade 2.3.4.4. H5N6 and/or H5N8 this fall, and very dangerous HPAI & LPAI H7N9 viruses spreading next door in China, the addition of H7N7 to South Korea's constellation of circulating avian flu viruses is a complication they could probably do without.